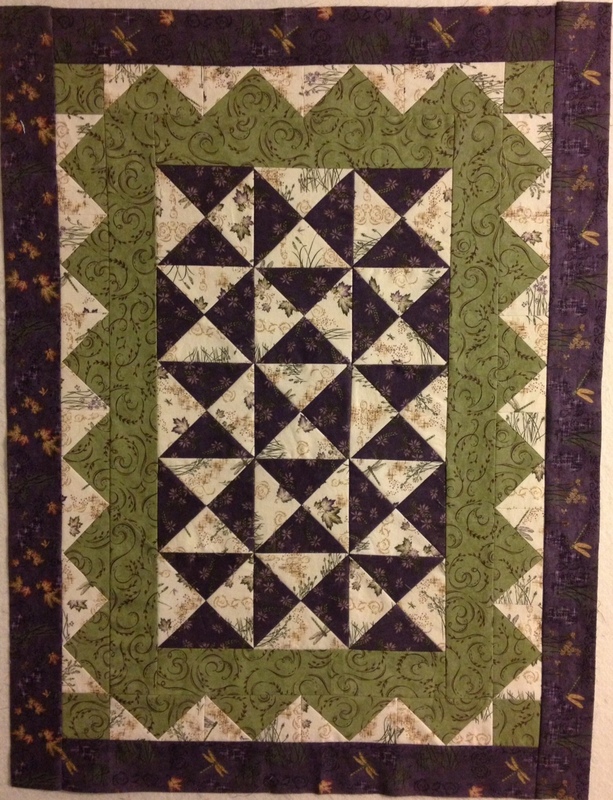 I actually really like mystery quilts. So most of my readers will ask. 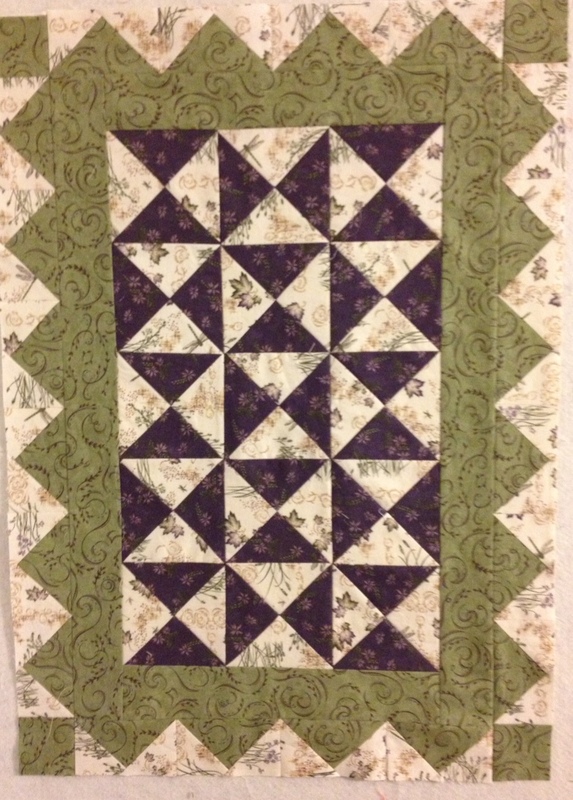 . . what is a mystery quilt Bodine? (My maiden name is Bodine btw) Ok, I’ll tell you. 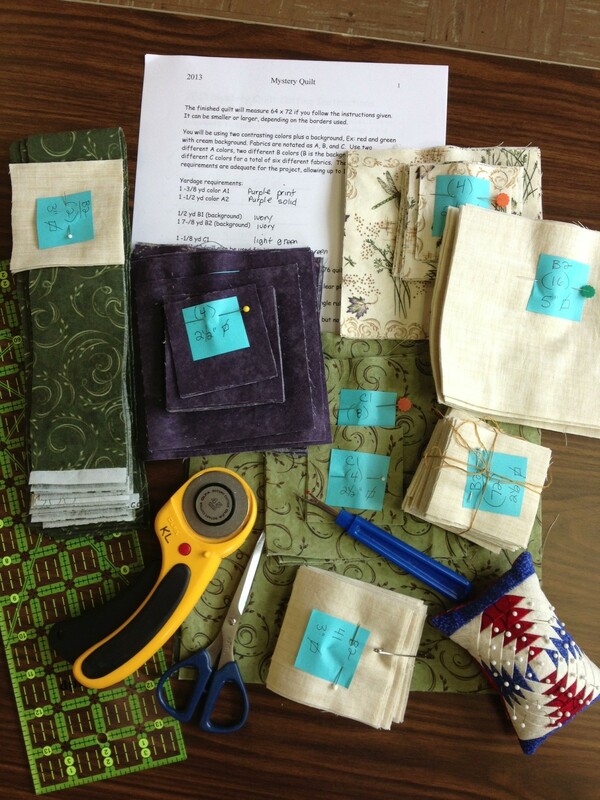 I signed up for this Mystery Quilt class with my friend Pam Kay. Yes, her last name is Kay. That’s a whole different story for another day. Anyway, I pay money to go to this class. Pam sends us an email telling us what fabrics we should buy, how much and suggested color ways. Next, she sends us an email with cutting instructions for the fabric. I have no idea what this quilt is going to look like. . .no clue whatsoever. So we show up for class with our sewing machines, and everything else we need to spend the day sewing. She feeds us all day; breakfast, lunch and dinner with breaks in between with cookies and chocolate and lemonaide. . .oh my! So, Saturday morning I started the day with this. We are given page one of instructions on how to start sewing our squares and rectangles together. So an hour later I have this. Still no clue what this mystery quilt will look like. But, it’s till fun. I have some hour glass blocks and flying geese. We keep sewing until almost lunch time and all I have are a bunch of hour glass block, flying geese and these rectangles. Yes, it really does take that long to do all this. There is actually a lot more of these than I am showing you. There are 16 of the hourglass blocks, 20 of the sage and cream flying geese, 28 of these rectangles, 44 of the cream and plum flying geese. OKAY, back to sewing some more flying geese. Yes, I did get tired of flying geese. But I did sign up for this, and I did say I liked Mysteries right? So some bigger flying geese in the picture above, 14 of them. So what did I do with all these? 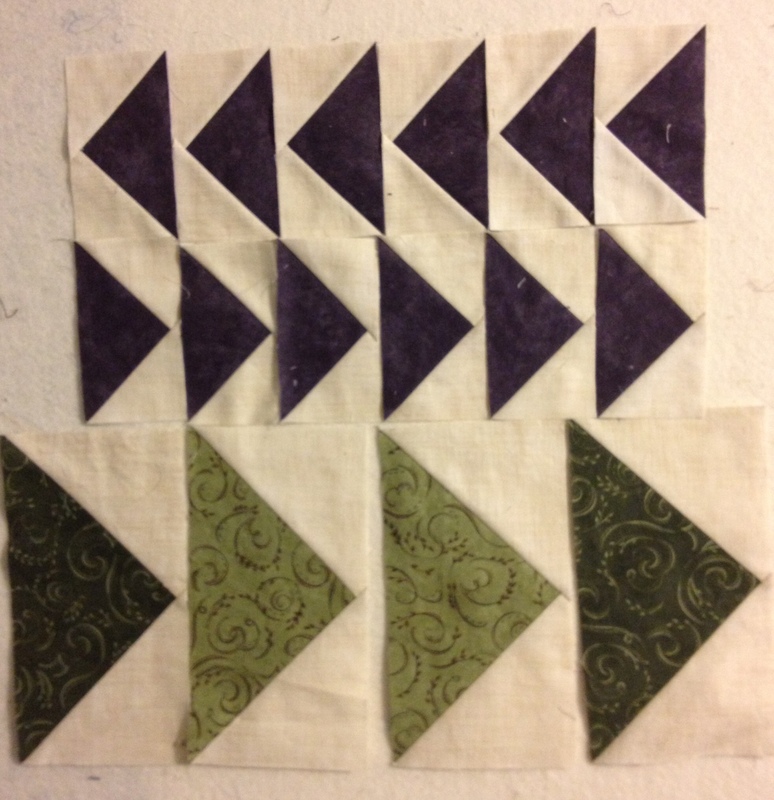 Well, the first step was to sew the hourglass blocks together like this. 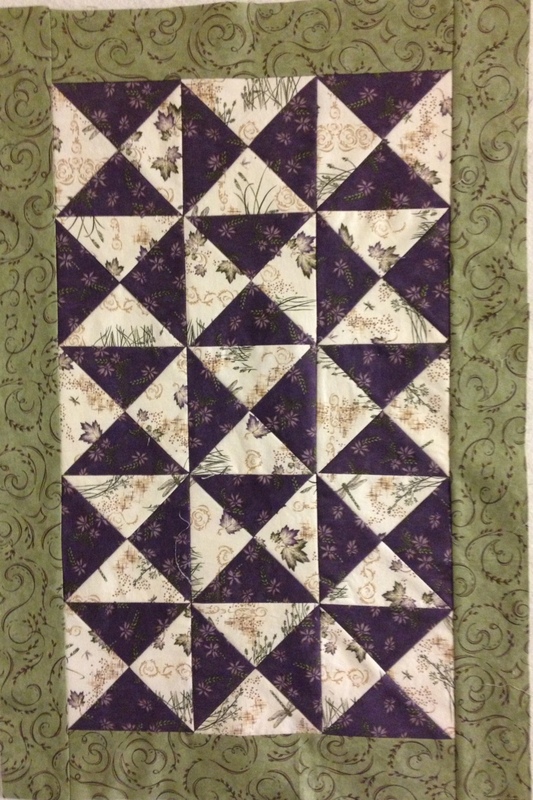 And then I sewed a 2 1/2″ border around it. Doesn’t look like much so far, right? Here’s the next part. It’s with the flying geese. Do you see them? How about I put a border around it? 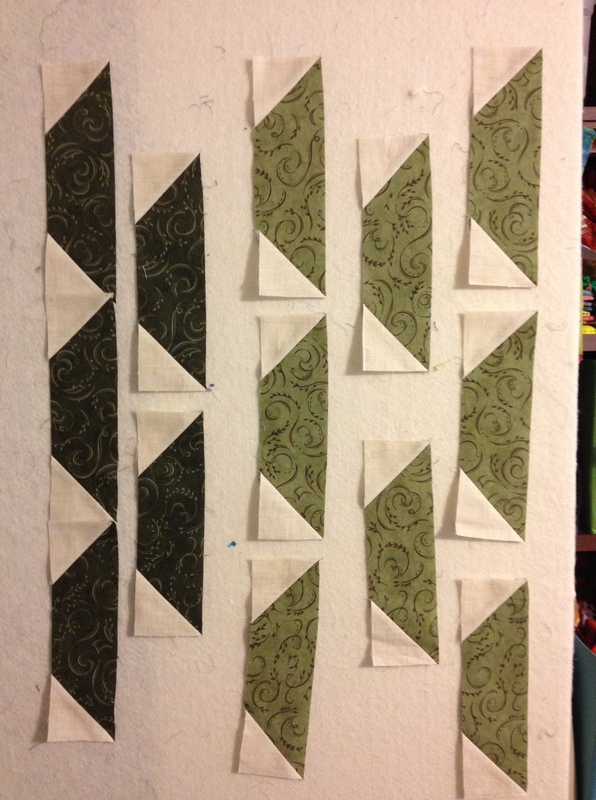 Ok, another 2 1/2″ border. Well, like I said, it’s a mystery. So you’ll have to check back in later to see what’s next. I promise I will finish it hopefully this week. It’s because of you that I started up again. Thanks for the encouragement. Keep it coming.